September already? And what happened in August. Where did August go? But September now stretches before us. September, which is seventh month of the Roman calendar, does not seem to have any particular ties to myth or man among the Romans, however, as Seven is usually viewed as a magical number, magic and spells will be our theme for this month. Please let me know if there is anything you would like to see. I will be out of town from the 14th-16th of September at ACD Distribution’s Open House. May or may not be able to reply much while I am there but I will certainly have news to share when I return. The joint law offices and temple to the god of contracts hummed with activity. There were always those who needed legal opinions and contracts in the city of merchants. Not everyone was willing to accept a traders word, some required more. The lawyer-priests were happy to oblige, for a small fee, acting as witnesses, advisers, oathkeepers and -very rarely- enforcers of contracts. For the most important of deed, only the most secure of certificate would do, and those with the wealth to demand them often did. These too, the lawyer priests would provide, blessed to be ageless and sealed to prove their provenance. These legal documents are often heavy scrolls or, more rarely, bound into books gathering a variety of them (sometimes called a cartulary). In any case, they are always on durable material and usually festooned with wax or lead seals at the bottom. Trollhunter is a wonderful low-budget Norwegian film about a group of Uni students making a film who stumble across a great secret, that there are trolls and the government has a branch that covers up their existence. While it is entirely low budget, the effects are good and atmospheric (even if the trolls look a little goofy they still manage to be frightening) and it is well written. Overall, I thought it was well worth watching. Note, however, that we watched it in Norwegian with subtitles, I can make no claims as to how good (or bad) the English dubbing is. Modern Monsters, the explanation of trolls and how they (still) exist in the modern world is fairly plausible. It tries to fold the legends of trolls into a modern ‘scientific’ understanding and done quite well. Using Technology, the adaption of technologies, modern and ancient, to the problem of dealing with trolls is well done. Documentary Format, leading to some shaky cam moments, but not as bad as say Cloverfield or Blair Witch. The Breaking of Fostor Nagar: City of Grinding Ice is a 48-page PDF (45 pages if you remove the covers, OGL page and ads) adventure for the Pathfinder RPG written by Ben McFarland and published by Rite Publishing. This review is only of the PDF though it also comes with a complete plugin for the Maptool virtual tabletop system. 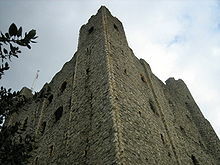 Ironclad is a movie based (very loosely) on the historical siege of Rochester Caster (1215) by King John of England. Showing a siege. Both from attacker and defenders viewpoints and the problems facing both sides including storming/defending the walls, supplies (and lack thereof) and morale. Also, trebuchet! The visuals with these medieval siege weapons were quite well done. Brutality of medieval combat, no sugar-coating of the combat in this film, blood and gore abounds in the combat scenes with everyone fighting dirty to survive. Unfortunately, there are a lot of quick cuts and shakey-cam usage so it is difficult to actually make sense of what is happening in most of the fights beyond mayhem and bloodshed. So, if you want to be inspired about running a castle defense (or assault) in your fantasy campaign, give it a look. Norvis the Blue, Initiate of the People, shook his head at the poster. The Magisterium was getting desperate, soon their corrupt edifice they called a government would collapse like the rotten husk it was and Norvis would be there to cheer the people on. His hand tightened around his copy of the Book of the Common People, its truths so sublime that they alone were inspiring the people to rise up. Even threats of torture and fire, jail and death, would not stop the people from claiming their lands and freedom back. And tonight, the rising would begin. And all because of a book. These small books, often bound in red cloth or leather, are filled with tightly printed arguments and quotes to bolster the speech and deed of any revolutionary. Usually, My games are more of the Social, Fun and “Beer & Pretzels” style. After all, we game to have fun, yes? My games rely on a lot of Improvisation rather than pre scripted content. I work best with minimal scripting. My games will tell an interesting Story, at least in retrospect. I will Mirror back player ideas I think are interesting in the game. After all, they usually come up with wonderful ideas too. Characters in my games are Destined for greatness, not random death. Though being stupid will still get you killed. My games are Gonzo and can include a lot of strangeness. My games can be Scary. But usually not both at once. A fun exercise. Go visit Strange Magic and see what fits your style. You are currently browsing the Sea of Stars RPG Design Journal blog archives for August, 2011.